I would add the following final thought to my previous blog: No forecast that doesn't contain information about the uncertainty of the forecast can be honest. Uncertainty is inevitable with any forecast and to issue a product without including that information is dishonest and unprofessional. If people want to use a long-range forecast as if it were just as accurate as a 1-day forecast, even after being told about the uncertainties, that's their choice. But if we want to be professionals, we need to be honest, regardless of whether or not people choose to listen to our caveats. OK - moving on to my next topic, I want to spend a little time on an example of a conspiracy theory that doesn't involve climate science: the very weird and bizarre notion of the so-called "chemtrails". Up until a few years ago, I didn't know that this nonsense existed. The basic notion is that aircraft are dispersing chemicals via their contrails, and those chemicals are supposed to be associated with a whole array of fantasized evils. Weatherman Scott Stevens has resigned from WRGB (Channel 6) after station management accused him of lying about his credentials. In a statement read during Tuesday's 6 p.m. broadcast, David Lynch, vice president and general manager, said WRGB "hired Scott Stevens to be chief meteorologist based on faulty information provided by Scott" and his agency. WRGB subsequently learned that "Scott has never completed the necessary academic course of studies that would lead him to the official title of meteorologist,'' according to the statement read by anchorwoman JoAnne Purtan. In effect, he has essentially zero qualifications to engage in such claims. It seems that these days anyone can make any wild claim they wish, including those that are virtually complete fabrications, and they can put such garbage out via the Internet. Gullible, ignorant people are taken in by such nonsense, and the followers of such can infect others easily via electronic media. This applies to a lot of such imaginary conspiracies (like the putative conspiracy by climate scientists to defraud the world into believing in anthropogenic global warming). I'm a huge fan of the freedom of speech on the Internet - but people need to take some time to consider what is and is not credible. Wild "scientific" ideas are common in today's world and nonprofessionals might easily be taken in by them People need to be able to recognize reliable sources from the loonies out there trying to convince you of such absurdities as the government is using aircraft to fill the air with chemicals that will harm you. ... the theory of byuons, allegedly realized by means of a positive feedback between the tornado updraft and the cosmological vector representing the global anisotropy. as an "additional energy source" for tornadoes, and so on. 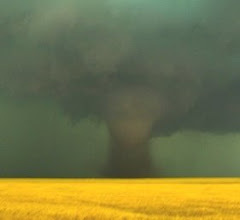 My favorite subject - tornadoes and severe storms - long has been a magnet for crackpots and those who think they know something the subject but in reality are profoundly ignorant about severe storms meteorology. When I dispute their ideas, I've even been subjected to insults. As a recent example from someone responding to one of my blogs, he called me a "government paid phoney" and said about my science that "One thing we know is that it will be meaningless. It will be pseudoscience. It will be more Doswellian lunacy." You are not a scientist. You are a pretender. You soak up public funds pretending you understand something you don't. You are a fraud. It never even occurred to any of you phoneys to test the notion that steam can persist at temps below boiling point of water. Because you are not scientists. You are a pretenders. You bozos couldn't do an experiment if your lives depended on it. You pontificate about convection/buoyancy, latent heat and you produce phoney vortex equations. And it's all meaningless. And people die. Every year people die. Kid lose parents. Parents lose kids. People lose their homes. Become paralyzed. And you crackpots continue to pretend you understand something you don't. I'm allowing this to post, despite your insults and not following my requirements, because it reveals something about you and your perceptions of the science to my readers. I believe you have some major mental health problems and I suggest you seek help for them.